The Rebel Sweetheart. : Spotlight | Cetaphil Gentle Skin Cleansing Cloths. Spotlight | Cetaphil Gentle Skin Cleansing Cloths. I was never a big fan of cleansing tissues, mostly because I like going through the whole intricate process of removing makeup (i.e. wipe the gunk off with makeup remover, wash my face with my favorite cleansing foam, rinse). Yeah, I'm OC like that. Also, I used to think cleansing tissues aren't at par with its bottled counterparts (ergo, liquid makeup removers) in terms of removing all the dirt, grime, and gunk off your face. However, these Gentle Skin Cleansing Cloths from Cetaphil made me think otherwise. 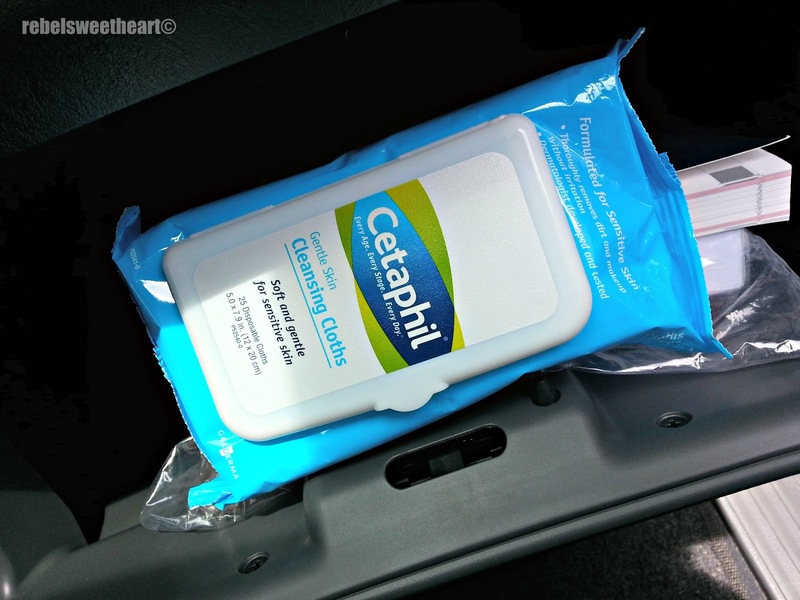 Cetaphil Gentle Skin Cleansing Cloths. Cetaphil Gentle Skin Cleansing Cloths are pre-moistened cloths that remove dirt and makeup without drying or irritating the skin. These cloths are soft and gentle, and they're safe even for the most sensitive skin. They're unscented, and that's a plus if you don't like overly scented skincare products. Ingredients, plus directions for use. This product is perfect for days nights when you're too lazy to go through the entire process of cleansing, toning, and moisturizing. These cloths require no rinsing - meaning, you can just wipe this on your face and go straight to bed! And thanks to its mild, soap-free, and non-comedogenic formula, you get clean and moisturized skin without having to worry about residues that can clog your pores. To use this product, simply lift the lid to remove cloth. Gently wipe your face, including the eye area, to remove makeup and impurities. No need to rinse afterwards. Close lid securely after each use. Cleansing cloth folded in three parts. They're pretty long and stretchy in actual. All that gunk from my face! Cetaphil Gentle Skin Cleansing Cloths sell for Php 235 per pack, each containing 25 disposable cloths. Cetaphil products are available at leading drugstores (Watson's, South Star) and supermarkets nationwide. I have sensitive skin, so these are perfect for me. I will have to try them. I've never tried the wipes, but I use the lotion and the face wash and let me tell you, since I started using cetaphil products my face no longer breaks out! I've been a long time sufferer of adult acne and I'm so happy with cetaphil's gentleness on my skin. I very rarely ever change from using anything else...why change it when it works!? I think these would be perfect on the go where there isn't any water. Or you could even use them after you use your traditional methods. I truly love this product have been using for years. Leaves the skin feeling refreshed and clean. Thanks for sharing! Wipes like these are awesome for taking off makeup, and make a lot less mess than regular soap and water. Genius idea to keep them in the car with you for on-the-go messes. I've been using Cetaphil for years. I didn't know they have the wipes. I will look for this. The few Cetaphil skin products that I have used in the past worked really well. I will have to give these wipes a try too. This is the first time I am hearing about this brand Cetaphil. I am always using wipes to clean as I have very sensitive skin. This pack looks so compact & neat. Great to hear that it is soap free and non-comedogenic free as well. Will give a try! I had no idea Cetaphil had wipes. We use the liquid in a pump all the time.